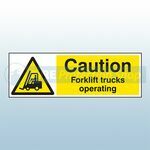 Available from the Fire Protection Shop are a range of caution forklift trucks operating signs available to buy. The signs are available in rigid plastic in sizes 300mm x 100mm, 400mm x 300mm and 600mm x 200mm. 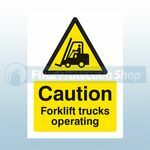 The signs are a great way to warn visitors and staff to be aware of forklift trucks in operation and to take extra care. The signs should be displayed in warehouse areas, loading bays and car parks etc.